Free Consultation - Water Well Drilling Equipment Mudslayer Mfg. Mudslayer Manufacturing designs and manufactures portable mud management (shale shaking) machines for water well drilling companies. Shale shakers are often simply called "shakers." 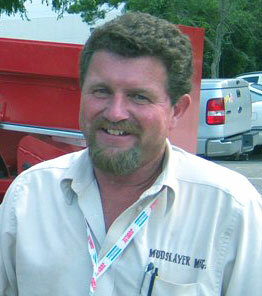 "I have been in the well drilling industry all of my life. All of the elements of this mud system have been proven in the field. The bottom line is that we drillers need to have the right equipment to make the money that we deserve. The MudSlayer will help you make more money." The equipment that we make is a portable mud cleaning, recycling and environmental protection system and is the ultimate in cost effective portable mud management and solids management systems. Complete the Free Consultation Request Form Below and I'll get in touch with you.